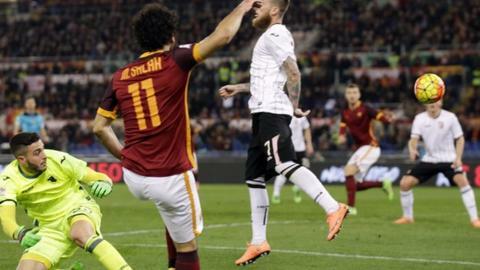 Roma recorded a crushing 5-0 win over struggling Palermo to make it five successive Serie A victories as they moved up to fourth in the table. Edin Dzeko recovered from a shocking miss to score the first and last goals in Roma's biggest win of the season. Seydou Keita poked in Roma's second following a 52nd-minute corner. And Mo Salah finished well twice in three minutes as Roma again coped without dropped club legend Francesco Totti, who watched from the stands. Relive all the action as it happened here. Totti was left out of Roma's squad by Luciano Spalletti following criticism of the coach in a television interview. Dzeko's failure to side-foot into an open goal might have made life awkward for Spalletti. But the home supporters were soon back on side when Dzeko drilled in his fifth Serie A goal of the season moments later. Palermo offered little as their slide towards the relegation places continued with a fifth game without a win. Roma totally dominated the second half with Keita getting his first goal of the season and Salah going into double figures. The Egyptian international converted a Dzeko assist to slot home the third goal and then curled the ball in from the tightest of angles to make it 4-0. Former Manchester City striker Dzeko added his third goal in three games when he powered home a header from Diego Perotti's cross a minute from time. Roma are now just two points behind third-placed Fiorentina as they continue to push for a Champions League place and were further boosted by the return from injury of midfielder Kevin Strootman as a substitute following more than a year out with a knee injury. Roma coach Luciano Spalletti: "Totti is the best player in the post-war era and deserves respect, but so do all the other lads. "There are rules in place for managing the group and I had to deal with Totti's reaction. "Totti had a moment of anger and that can happen in certain circumstances. "The situation is in the past. He was at the stadium and in the changing room. He'll train with us on Monday." Match ends, Roma 5, Palermo 0. Second Half ends, Roma 5, Palermo 0. Attempt blocked. Iago Falque (Roma) left footed shot from outside the box is blocked. Assisted by Radja Nainggolan. Iago Falque (Roma) wins a free kick in the defensive half. Foul by Aleksandar Trajkovski (Palermo). Goal! Roma 5, Palermo 0. Edin Dzeko (Roma) header from the centre of the box to the high centre of the goal. Assisted by Diego Perotti with a cross. Substitution, Roma. Diego Perotti replaces Mohamed Salah. Uros Djurdjevic (Palermo) wins a free kick in the defensive half. Foul by Enzo Maresca (Palermo). Substitution, Roma. Kevin Strootman replaces Maicon. Attempt missed. Alessandro Florenzi (Roma) right footed shot from outside the box is close, but misses to the left. Assisted by Mohamed Salah. Attempt missed. Radja Nainggolan (Roma) right footed shot from outside the box misses to the left. Assisted by Lucas Digne. Aljaz Struna (Palermo) is shown the yellow card for a bad foul. Seydou Keita (Roma) wins a free kick on the left wing. Foul by Aljaz Struna (Palermo). Substitution, Roma. Iago Falque replaces Miralem Pjanic. Substitution, Palermo. Uros Djurdjevic replaces Alberto Gilardino. Offside, Roma. Miralem Pjanic tries a through ball, but Edin Dzeko is caught offside. Substitution, Palermo. Enzo Maresca replaces Franco Vázquez. Attempt missed. Radja Nainggolan (Roma) right footed shot from outside the box is close, but misses to the left. Assisted by Lucas Digne. Attempt missed. Seydou Keita (Roma) header from the centre of the box is too high. Assisted by Miralem Pjanic with a cross following a corner. Attempt blocked. Lucas Digne (Roma) left footed shot from the left side of the box is blocked. Assisted by Miralem Pjanic with a cross. Attempt blocked. Edin Dzeko (Roma) left footed shot from the left side of the box is blocked. Assisted by Radja Nainggolan. Corner, Roma. Conceded by Sinisa Andjelkovic. Offside, Palermo. Oscar Hiljemark tries a through ball, but Franco Vázquez is caught offside. Goal! Roma 4, Palermo 0. Mohamed Salah (Roma) left footed shot from a difficult angle on the right to the centre of the goal. Assisted by Radja Nainggolan. Corner, Palermo. Conceded by Seydou Keita. Attempt blocked. Franco Vázquez (Palermo) left footed shot from outside the box is blocked. Goal! Roma 3, Palermo 0. Mohamed Salah (Roma) left footed shot from the left side of the box to the bottom right corner. Assisted by Edin Dzeko. Offside, Palermo. Franco Vázquez tries a through ball, but Aleksandar Trajkovski is caught offside. Offside, Roma. Mohamed Salah tries a through ball, but Edin Dzeko is caught offside. Attempt missed. Aljaz Struna (Palermo) header from the centre of the box is too high. Assisted by Aleksandar Trajkovski with a cross following a corner.